The average rainfall in England is 40 inches per year. If you hate the bedraggled look pretty much every day of the year, you probably wouldn't want to move to Dalness, a little Scottish town in the Highlands. They get 130.16 inches of rain per year. Now, let's jump across the Atlantic to get a comparison. Forks, an old logging town in Washington famous for its Twilight series connection receives 119.7 inches of rain while Arizona gets a mere 12.7 inches per year. Having been drenched more times than I can remember, I've decided that the sensible thing to do is to invest in a decent raincoat. Umbrellas are useless on windy days. There's a plethora of raincoats in every color, shape and form but call it vanity, I don't want to look like I'm wearing a standard mac. Or God forbid, something floral complete with a plastic scarf tied under my chin. The common variety in the shops are more suited to mountain trekking but completely inappropriate for work. The ideal raincoat has to be chic, showerproof, mid length and preferably with a hood attached for days when I can't be bothered with an umbrella. I've never thought much about wellies (rain boots) but after getting splashed by cars driving over puddles, I've considered waterproof boots to be extremely practical. My favorites would have to be the two Burberry packable coats from the more affordable Burberry Brit range. What a brilliant idea. The trench can be folded and stored in the small pouch. The shorter version has a hood that can be buckled down when not needed. Just toss it into your handbag and save it for a rainy day. Just out of curiosity, how do you cope with rainy days? Hoods, never umbrellas, they are more stress than they're worth. Oh if i could ever move to London, UK i would praise the rain constantly pooring on me. LOL. love the collection of the raincoats, the number two black one is super chic and the number 5 khaki one is so military. Actually i was wondering except the rain how is life in UK? is it really to intergrate in the community? finding a job? since i am already european i know that i need no visa to move to UK like i bet you did (didn't you?) but still i have my reservations. Marianne, I'm more than happy to answer your questions regarding immigrating to UK. Can you email me directly? Ha! Raincoats happen to be another obssession of mine. There are different levels of rain and I have a choice of raincoats to suit plus umbrella and wax hat. I only recently got 2 casual jackets with hoods which is new for me so feel I'm well prepared on that front for a change! LOL at the plastic scarf and floral raincoat! I've seen these around here. That shorter Burberry packable raincoat is fantastic (navy!!) . I was eyeing it a while back but it seems permanently sold out in my size. It gets excellent reviews on the websites that sell it. Love those Barbour boots too! Where is your previous entry? Wanted to oogle your outfits again. Believe it or not, I've seen quite a few ladies wearing the floral raincoat and plastic scarf combo in town! Feet are fine in Winter time as my beloved boots will cope well and I do have a rather large collection . But Summer...I only wear sandals or ballet flats so I always find that more difficult ! I suppose I dig out some Tods loafers , but I really don't like other shoes very much so hardly own any . Otherwise it's one of my old Burberry trenches or a leather jacket . i do like the look of the Burberry parka ! italian weather is insane right now. its getting pretty hot here but who knows the next day.. probably will rain!!! 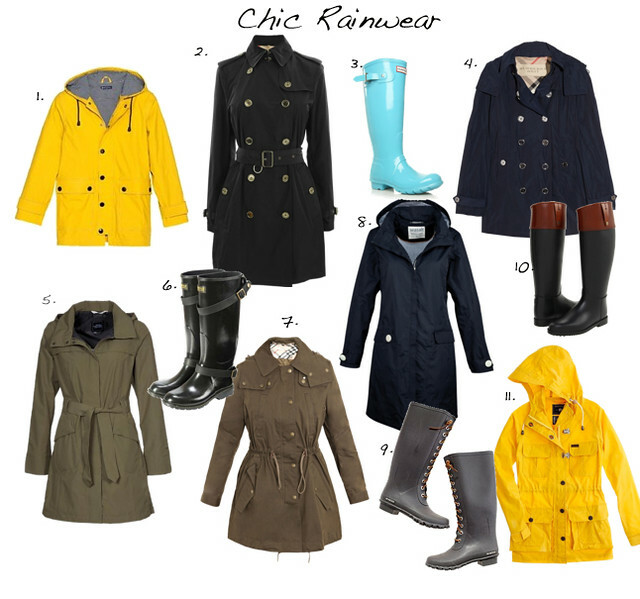 these pieces would be perfect for rainy days! They are beautiful! What an irony.. it rained less than 10 minutes put together last year and this, here in Dubai.. what we need are 'sand coat' (LOL, if only there is such a thing) for the frequent sand storm! I want to find a good raincoat, I probably will have to invest in one soon as the weather has been cold and rainy all week (and will continue to be next week too, apparently). Umbrellas are just ridiculous and they always flap up whenever it is windy. It is never rainy and calm! thank goodness it doesn't rain as much in sydney - though when it does i usually have my hunter boots on and a big umbrella. never was one for raincoats much, if just because i don't think it rains hard enough to justify one! love your selection as always. as for umbrellas - senz umbrellas are a lifesaver! Love the selection here. The Burberry one is so very stylish but the yellow ones are very cheering and remind me of my Aubin & Wills one which I do love and showed in my blog (http://susiesoso.blogspot.co.uk/) a week or so ago when the weather was nothing like what it is now! I also have some aubergine tall hunter boots which are good protection when the boys want a good puddle jumping session! For wellies they are pretty smart and slimming which is probably why they are classics. Please don't hate me anyone but I really don't like the really kitsch patterned "kooky" ones i.e. spotty, floral etc. I rarely carry an umbrella - I need to be handsfree for all the I end up carrying. Sorry, I meant to say "for all the rubbish" I end up carrying. ahhhhh i adore the teal colored hunter wellies!! I have the short version of the black Burberry packable trench. It's my vacation staple and has saved me many times- especially in Amsterdam! It IS on the short side but serves its purpose and always looks nice. AND I got it for a steal at a Burberry outlet! I have fur lined hunters which I love, but they are a little hot for the summer. And my best tip is..... buy your umbrellas from James Smith & Son on New Oxford Street. they're not cheap but they have a lifetime guarantee (as long as you don't keep losing them like I do) and they NEVER turn inside out in the rain. The shop's been there since the 19th Century and it's unchanged inside. it's wonderful! I love those Burberry rain boots. You just inspired me to look up the annual rainfall in NYC and it's 45 inches. It feels like more but I think that is due to the fact that I walk a lot. When I lived outside of NY, I was sheltered by my car and I didn't even own an umbrella! I love all of the trenches. I'm such a sucker when it comes to a beautiful trench. I love the Burberry boots. The beginning of May was really rainy so I've been relying on rain boots. Still searching for the elusive perfect raincoat! Just tried one on this morning actually!